The research includes 84 patients with leptospirosis treated in Clinic at Infectious Diseases – Pleven. Mild course in 52,38%, moderate in 19,05%, and severe in 28,57% are established. Serum amylase level has been investigated in 37 cases. Increased rates are measured in 41,67% of mild cases (av. 279 U/L), in 25% of moderate cases (av. 290 U/L), and in 88,24% of severe cases(av. 937 U/L). Significant difference between serum amylase levels of mild and severe cases is established (p < 0,02). Presumably immunological mechanisms of damage by participation of interleukins (IL1, IL6, IL8) and tumor necrosis factor (TNF-β) are in the base of increased serum amylase level in leptospirosis. The functional changes of pancreas in leptospirosis are not fully clear and further research is needed. Key words: leptospirosis, pancreas, serum amylase, interleukins. 3. Abdulkader RC, Daher EF, Camargo ED et al. Leptospirosis severity may be associated with the intensity of humoral immune response. Revisia de Instituto de Medicina Tropical de Sao Paolo, 44, 2002, 79-83. 4. Daher EF, et al. Pancreatic involvement in fatal human leptospirosis: clinical and pathological features. Rev do Inst de Med Trop de Sao Paulo, 2003, 45, 307-313. 5. Faine S. Lepotospirosis. In: Hausler WJ, Ir. Sussman M. eds. Topley and Wilson. Microbiology and Microbial Infections. 9th ed. London: Amold; 1998, 849-869. 6. Farr RW. Leptospirosis. Clin. Inf. Dis., 1995, 21, 1-8. 7. Grewal H., A. Mohey, RL. Diu L. et al. Amelioration of the physiologic and biochemical changes of acute pancreatitis using an anti-TNF-a polyclonal antibody. An. J. Surg., 167, 1994, 214. 8. Ko AI., Galvao Reis, Ribeiro Dourado et al. Urban epidemic of severe leptospirosis in Brasil. Lancet, 354, 1999, 820-825. 9. Kusske A., A. Rangione, M. Levis et al. Interleukin – 10 reduces the severity of acute hemorrhagic pancreatitis in rats. Gastroenterology, 110/4, 1996, A, 407. 10. Miller G., D. Pritchard, R. Ritts et al. Effect of surgery on the quantity of lymphocyte subpopulation. J. Surg. Res. 21, 1996, 155-156. 11. Norman J., G. Fruk, M. Franz et al. Active Interleukin - 1 (IL1) receptor required for maximal progression of acute pancreatitis. Ann, surg., 223, 1996, 163. 12. Reth M. The B cell antigen receptor complex and co-receptors. Immunology today, 16/7, 1995, 241-250. 13. Singh SS., Vijayachari P., Sinhe A., Sugunen AP., Pasheed MA., Seghal SC. Clinico-epidemiological study of hospitalized cases of severe leptospirosis. 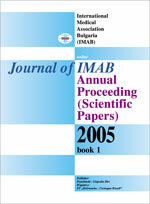 Indian Journal of Medicine Research. 109, 1999, 94-99. 14. Suzuki S., M.Masuda, Oht M. et al. Interleukin-6 (IL6) receptor monoclonal antibody improved severe acute pancreatitis in IL6 trangenic mice. Gastroenterology, 1999, 116/4, A, 1166. 15. Tschaikowsky K., N. Lehnert, A. Schiele et al. Prognostic value of immunomonitoring in patients with polytrauma and sepsis. British Journal of anaestesia, 1998-80 supp 1, 156. 16. Watkins S. Complement and clinical intervention. Ann. Anesth. Reanim. 4/2, 1985, 129-132. 17. Zaki SR. et al. In: Nelson Am. Horsburg Cr Jr. Eds. Pathology of Emerging Infections L, Washington, Dc: American Society For Microbiology, 1998, 73-92.